Wind, waves, and currents are no longer a problem for a section shoreline in Lac Saint Jean. 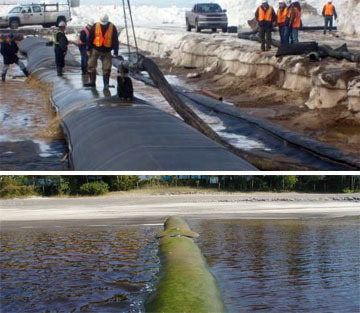 A Geotube® shoreline protection system was able to prevent shoreline erosion issues and improve bank conditions at the Quebec lake. Because the lake acts as a water reservoir for the generation of hydroelectric power, operators keep the water level high. This artificially high water level can potentially destabilize the lake’s shoreline. Since 1986, the site owner has been taking a proactive approach to prevent shoreline erosion. Three groynes were constructed using Geotube® containers, allowing for the elimination of erosion along a section of shoreline. Each groyne incorporates two Geotube® containers that stretch 200-feet (61-metres) into the lake. In an unusual step, the installation occurred during the winter, as the lake was frozen over. This approach enabled installation of the containers to occur in a dry area rather than in deep water. Each Geotube® container was placed on a protective scour apron and held in place with anchor tubes. Trucked-in sand was mixed with water from the lake, and pumped into each container. As the lake thawed, water flowed in around the Geotube containers and covered them almost entirely. Geotube® containers provide significant advantages over conventional construction techniques for jetties or groynes. Typical groynes often incorporate wood, earth, stone, or concrete, making them susceptible to breakage by ice and waves. Conversely, a full Geotube® container becomes a single, massive structure that is virtually immovable. In many cases, a Geotube® groyne can be installed more quickly and at a lower cost than conventional approaches. Contact us to discuss dewatering options for your WTP.